ในวันที่ 1 กุมภาพันธ์ ค.ศ. 2013 สตาร์บัคส์ได้เปิดสาขาแรกในโฮจิมินห์ซิตี ประเทศเวียดนาม และประกาศว่าจะเปิดสาขาในประเทศโคลอมเบีย ในปลายเดือนสิงหาคม ค.ศ. 2013 ในการประชุมที่โบโกตา ซึ่งประธานบริษัทได้กล่าวว่า "สตาร์บัคส์เคารพและชื่นชอบประเพณีของกาแฟในโคลอมเบีย"
เดือนสิงหาคม ค.ศ. 2014 สตาร์บัคส์ได้เปิดสาขาแรกในวิลเลียมส์เบิร์ก ในบรูกลิน ซึ่งสาขานี้เป็นหนึ่งใน 30 สาขาของสตาร์บัคส์ที่วางขายเบียร์และไวน์. ในปี ค.ศ. 2012 สตาร์บัคส์ได้เปิดตัว สตาร์บัคส์ เวริสโม ซึ่งเป็นเครื่องทำกาแฟขนาดเล็กที่สามารถทำเอสเปรสโซและช็อกโกแลตจากเครื่องได้ โดยตัวเครื่องใช้ระบบ K-Fee และมีถ้วยชนกาแฟที่มีถ้วยเดียว ในการวิจารณ์ของคอนซูเมอร์รีพอตส์ต่อรุ่น 580 นั้นได้ทดสอบและระบุไว้ว่า "การล้างถ้วยทุกครั้งไม่ใช่ความสะดวกสบายของการทำกาแฟในเวลาที่ต้องการหลาย ๆ ถ้วย ส่วนรุ่นอื่น ๆ ยังมีตัวเลือกเพิ่มเติมที่จะสามารถปรับระดับความเข้มได้ แต่เวริสโมมีเพียงปุ่มทำกาแฟ, เอสเปรสโซ และ ลาทเต ไม่มีปุ่มที่จะปรับระดับความเข้ม เหมือนสตาร์บัคส์ต้องการที่จะจำกัดในการใช้แบรนด์ของพวกเขา ซึ่งมีเพียง 8 รูปแบบในการใช้นมสำหรับการทำลาทเต"
ในเดือนมกราคม ค.ศ. 2011 สตาร์บัคส์ และ ทาทาคอฟฟี ผู้ผลิตกาแฟรายใหญ่ที่สุดของเอเชีย ได้วางแผนเป็พันธมิตรเชิงกุลยุทธ์ร่วมกันเพื่อที่จะเปิดสาขาในประเทศอินเดีย โดยใช้แหล่งวัตถุดิบของเมล็ดกาแฟจากทาทาคอฟฟีในเมืองโคดากู แม้จะเคยล้มเหลวในปี ค.ศ. 2007 ในเดือนมกราคม ค.ศ. 2012 สตาร์บัคส์ได้เปิดเผยถึงหุ้นส่วนกับทาทาคอฟฟี ซึ่งถือหุ้นร่วมกัน 50:50 โดยใช้ชื่อว่า ทาทาสตาร์บัคส์ ซึ่งจะใช้ชื่อนี้สำหรับการทำการค้าในประเทศอินเดียเท่านั้น โดยสาขาแรกเปิดที่เมืองมุมไบ ในวันที่ 19 ตุลาคม ค.ศ. 2012. ในปี ค.ศ. 2003 หลังจากที่ต่อสู้ในการแข่งขันกับร้านกาแฟท้องถิ่นอย่างยาวนาน สตาร์บัคส์ได้ปิด 6 สาขาใน ประเทศอิสราเอล โดยระบุว่า "มีความท้าทายในการดำเนินงานมากเกินไป" และ "มีความยากลำบากทางสภาพแวดล้อมของธุรกิจ"
สตาร์บัคส์ในพระราชวังต้องห้าม ในปักกิ่ง ได้ปิดตัวลงเมื่อเดือนกรกฎาคม ค.ศ. 2007 ซ฿่งเป็นที่ถกเถียงกันอย่างต่อเนื่องในความเหมาะสมตั้งแต่เปิดร้านใน ค.ศ. 2000 ซึ่งผู้ประท้วงได้อ้างว่าการที่มีร้านค้าอเมริกันมาตั้งในพระราชวังต้องห้ามเป็นการ "เหยียบย่ำวัฒนธรรมจีน"
↑ 1.0 1.1 1.2 1.3 "Starbucks financial report 2017". NASDAQ. ↑ "Starbucks". forbes.com. May 2013. สืบค้นเมื่อ February 21, 2014. ↑ "Company Profile" (PDF). Starbucks Coffee Company. February 2008. Archived from the original (PDF) on October 15, 2009. สืบค้นเมื่อ May 13, 2009. ↑ "5 Things You Didn't Know: Starbucks | The Best Article Every Day". Bspcn.com. December 10, 2007. Archived from the original on June 27, 2009. สืบค้นเมื่อ May 9, 2014. ↑ 6.0 6.1 6.2 "Loxcel Starbucks Map". Starbucks. April 17, 2018. สืบค้นเมื่อ April 17, 2018. ↑ "How Starbucks Can Guarantee Its CEO Transition Succeeds". Fast Company. April 3, 2017. สืบค้นเมื่อ 2017-04-11. ↑ Time Out (2011). Time Out Guide San Francisco. Time Out Guides. ISBN 978-1-84670-220-4. สืบค้นเมื่อ April 9, 2013. ↑ "How Starbucks got its name - Seattle's Big Blog". Seattle Post-Intelligencer. สืบค้นเมื่อ October 21, 2015. ↑ Melissa Allison (March 9, 2008). "Starbucks co-founder talks about early days, launching Redhook and Seattle Weekly, too". Business and Technology. ↑ Stephen Brewer; Constance Brissenden; Anita Carmin (September 26, 2012). DK Eyewitness Travel Guide: Pacific Northwest. Dorling Kindersley. pp. 135–. ISBN 978-1-4053-7081-3. สืบค้นเมื่อ November 12, 2012. ↑ 14.0 14.1 Linda Dono Reeves (September 8, 1992). "Coffee firm's plans to go national are percolating". USA Today. ↑ "Starbucks Corporation." Student Resources. N.p., n.d. Web. March 13, 2013. ↑ 16.0 16.1 16.2 Mark Robichaux (November 6, 1989). "Boom in Fancy Coffee Pits Big Marketers, Little Firms". The Wall Street Journal. ↑ Florence Fabricant (September 2, 1992). "Americans Wake Up and Smell the Coffee". The New York Times. ↑ 19.0 19.1 19.2 "Forty years young: A history of Starbucks". London: The Daily Telegraph. May 11, 2011. สืบค้นเมื่อ November 13, 2012. ↑ "Interest brews for Starbucks Coffee retailer makes stock offering amid latest java craze". The Globe and Mail. June 17, 1992. ↑ "Mobile Payment At U.S. Starbucks Locations Crosses 10% As More Stores Get Wireless Charging". ↑ Saif Ajani (December 5, 2013). "Starbucks' @Tweetacoffee Campaign Generated $180,000 in Sales, HUGE Long-term Benefits". Keyhole. Keyhole. Archived from the original on December 15, 2013. สืบค้นเมื่อ December 24, 2013. ↑ Todd Wasserman (December 6, 2013). "Starbucks 'Tweet-a-Coffee' Campaign Prompted $180,000 in Purchases". Mashable. Mashable. สืบค้นเมื่อ December 7, 2013. ↑ Szabo, Liz (July 29, 1996). "Launching Starbucks In Japan -- First Of 15 Stores To Open". The Seattle Times. สืบค้นเมื่อ October 19, 2012. ↑ "McDonalds Corp Betting That Coffee Is Britains Cup of Tea". The New York Times. March 1999. สืบค้นเมื่อ August 6, 2009. ↑ Miguel Ángel Pallares Gómez (March 29, 2016). "Starbucks sigue como prioridad para Alsea". El Universal. El Universal. สืบค้นเมื่อ September 22, 2016. ↑ Tice, Carol (October 15, 1999). "Starbucks still seeking a rhythm for Circadia". Puget Sound Business Journal. สืบค้นเมื่อ May 13, 2009. ↑ "Starbucks establishes coffee trading company in Switzerland". October 17, 2002. สืบค้นเมื่อ November 12, 2012. ↑ Christine Frey (April 16, 2003). "A grande deal for Starbucks". Seattle Post-Intelligencer. สืบค้นเมื่อ December 1, 2012. ↑ Hirsch, Jerry (September 15, 2006). "Diedrich to Sell Cafes to Rival". Los Angeles Times. สืบค้นเมื่อ May 13, 2009. ↑ "Starbucks enters South America through Peru". Puget Sound Business Journal. August 19, 2003. ↑ Kramer, Andrew (September 7, 2007). "After long dispute, a Russian Starbucks". The New York Times. สืบค้นเมื่อ April 18, 2009. ↑ 33.0 33.1 33.2 Schwaner-Albright, Oliver (March 26, 2008). "Tasting the Future of Starbucks Coffee From a New Machine". The New York Times. สืบค้นเมื่อ April 1, 2010. ↑ Schofield, Jack (March 24, 2008). "Starbucks lets customers have their say". The Guardian. London. สืบค้นเมื่อ March 18, 2009. ↑ "Card Rewards". Starbucks.com. สืบค้นเมื่อ October 24, 2010. ↑ Roark, Marc (2014). "Payment Systems, Consumer Tragedy, and Ineffective Remedies". St. Johns Law Review. 86: Forthcoming. สืบค้นเมื่อ March 4, 2014. ↑ Lisa Baertlein; Martinne Geller (November 14, 2012). "Starbucks to buy Teavana in another step beyond coffee". Reuters. สืบค้นเมื่อ November 14, 2012. ↑ 38.0 38.1 Melissa Allison (December 31, 2012). "Starbucks closes Teavana deal". The Seattle Times. สืบค้นเมื่อ March 1, 2013. ↑ "STARBUCKS TO OPEN 1ST VIETNAM CAFE". Associated Press. สืบค้นเมื่อ January 3, 2013. ↑ "Starbucks, McDonald's go Vietnam". Investvine. สืบค้นเมื่อ January 14, 2013. ↑ "Starbucks opens first store in coffee-loving Vietnam". Archived from the original on November 3, 2014. ↑ AAP (August 28, 2013). "Starbucks to open first cafe in Colombia". The Australian. สืบค้นเมื่อ August 28, 2013. ↑ Thirsty NYC (August 19, 2014). "New Starbucks in Williamsburg to Serve Alcohol". Thirsty NYC. สืบค้นเมื่อ August 21, 2014. ↑ "Starbucks buying full control of Japan unit for $914 million" (Press release). Reuters. September 23, 2014. ↑ "Starbucks Announces Plans to Bring its Unique Coffeehouse Experience to the Vibrant Cambodian Market". Starbucks Newsroom. 26 August 2015. ↑ "Starbucks to Open Stores in Italy". Starbucks Newsroom. 28 February 2016. ↑ Brown, Peter (26 August 2016). "Wireless Charging Pads Come to Starbucks". Electronics 360. สืบค้นเมื่อ 21 November 2016. ↑ Sarah Perez (7 September 2016). "Starbucks debuts its own original content series, "Upstanders," featuring video and podcasts". TechCrunch. สืบค้นเมื่อ 9 September 2016. ↑ Kiviat, Barbara (December 10, 2006). "The Big Gulp at Starbucks". TIME. ↑ 50.0 50.1 Lerman, Rachel (January 9, 2015). "Schultz: Starbucks COO not leaving for health concerns, rumors are 'irresponsible'". Puget Sound Business Journal. ↑ Howard, Hannah (July 31, 2008). "Starbucks Breakfast Sandwiches: Now Less Smelly". Serious Eats. ↑ "Starbucks Names Kevin Johnson President and Chief Operating Officer" (Press release). Starbucks Corporation. January 22, 2015. สืบค้นเมื่อ September 5, 2015. ↑ Julie Jargon (October 6, 2015). "Starbucks Hires First Chief Technology Officer". WSJ. ↑ Youngme, M. & Quelch J. Starbucks: Delivering Customer Service. Boston, MA: Harvard Business School Pub., 2003. Online. ↑ Stanley, A. (2002). Starbucks Coffee Company. (case study). Tuck School of Business at Dartmouth. ↑ 56.0 56.1 Nanos, Janelle (December 7, 2012). "The Story of the Frappuccino: How a chilly coffee drink became a billion dollar behemoth". Boston Magazine. สืบค้นเมื่อ October 30, 2013. ↑ T., Katie (April 16, 2010). "A Cup of Low-Cal Goodness". Starbucks. Archived from the original on February 4, 2013. สืบค้นเมื่อ February 5, 2013. ↑ Food Ingredients Online (January 9, 2008). "Starbucks Latte And Mocha Offerings Get A Skinny Makeover To Help Coffee Lovers Feel Great In 2008". VertMarkets, Inc. สืบค้นเมื่อ February 5, 2013. ↑ "Starbucks Agrees to Hold the Hormones For Good" (Press release). Food & Water Watch. August 24, 2007. Archived from the original on September 13, 2007. สืบค้นเมื่อ August 27, 2007. ↑ 60.0 60.1 Baertlein, Lisa (June 3, 2009). "Starbucks revamps bakery food ingredients". Reuters. ↑ Jargon, Julie (September 30, 2009). "Starbucks Takes New Road With Instant Coffee". The Wall Street Journal. สืบค้นเมื่อ November 12, 2012. ↑ Miller, Michael (April 5, 2012). "Wine, beer at Starbucks?". Huntington Beach Independent. p. A4. สืบค้นเมื่อ April 7, 2012. ↑ Corbett, Alexandra. "Thirsty? Starbucks Supersizes to the Trenta". The Norwalk Daily Voice. สืบค้นเมื่อ July 19, 2012. ↑ Strom, Stephanie (September 20, 2012). "Starbucks to Introduce Single-Serve Coffee Maker". The New York Times. ↑ "Starbucks to open U.S. juice bars in 2012". Reuters. November 11, 2011. ↑ Green Coffee Extract Archived January 16, 2014, at the Wayback Machine. at Starbucks.com. Excerpt from Brian Smith, Director of Global Beverage Innovation: "100% green arabica coffee beans ... We start with high-quality, green coffee beans. We soak the beans in water and pull out the caffeine and other good stuff. Then we dry the whole concoction down to create the concentrated essence and goodness of green coffee. That's Green Coffee Extract." Retrieved July 20, 2012. ↑ "starbucks.com". Starbucks Newsroom. สืบค้นเมื่อ November 23, 2014. ↑ Horovitz, Bruce (February 4, 2015). "Starbucks to roll out coconut milk option". USA Today. สืบค้นเมื่อ December 11, 2015. ↑ "Responding to Customers, Starbucks Launches the Mini Frappuccino" (May 11, 2015). Starbucks. สืบค้นเมื่อ May 30, 2015. ↑ "Starbucks will buy Tazo tea company". Puget Sound Business Journal. January 13, 1999. bizjournals.com. สืบค้นเมื่อ November 13, 2012. ↑ 72.0 72.1 Julie Jargon. "Starbucks To Acquire Tea Chain Teavana". The Wall Street Journal (print). p. B9. ↑ Candice Choi; Sarah Skidmore (November 14, 2012). "Starbucks Buys Teavana". The Huffington Post. Archived from the original on March 8, 2016. ↑ "Starbucks Launches Teavana Hot Brewed Tea in Starbucks Stores in the U.S. and Canada". January 2, 2015. starbucks.com. สืบค้นเมื่อ June 3, 2015. ↑ Melissa Allison (March 10, 2010). "Coffee wrap: Starbucks spent $740K on lobbying last year, Le Whif, and an old hand takes a swipe at 'third wave' coffee". ↑ "A triple-venti-Americano-decaf surprise? Consumer Reports finds McDonald's coffee better than Starbucks". MSNBC. February 4, 2007. สืบค้นเมื่อ September 9, 2010. ↑ Ozersky, Josh (2010-03-09). "Is Stumptown the New Starbucks — or Better?". Time. สืบค้นเมื่อ 2015-10-31. ↑ Sacks, Danielle (September 2014). "The Multimillion Dollar Quest To Brew The Perfect Cup Of Coffee". Fast Company. สืบค้นเมื่อ 2015-10-31. ↑ "Verismo.com". Starbucks. สืบค้นเมื่อ May 21, 2013. ↑ ijnPerratore, Ed. "Does the Verismo coffeemaker deliver true Starbucks flavor?". Consumer Reports. สืบค้นเมื่อ May 8, 2013. ↑ Lerman, Rachel (January 15, 2014). 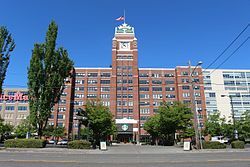 "Starbucks confirms layoffs at Seattle headquarters". Puget Sound Business Journal. ↑ González, Ángel (February 13, 2014). "Starbucks enters its 64th company, oil-rich Brunei". The Seattle Times. ↑ Starbucks Coffee Company. Starbucks.com.hk. Retrieved on July 18, 2013. ↑ "Starbucks Philippines". Starbucks Corporation. สืบค้นเมื่อ 22 November 2016. ↑ Calderon, Jason (June 17, 2013). "Thailand gets Asia's first community-driven Starbucks". Inside Investor. สืบค้นเมื่อ June 18, 2013. ↑ "Number of Starbucks stores in the United States from 2005 to 2015*". Statista. สืบค้นเมื่อ 19 March 2016. ↑  Archived June 18, 2015, at the Wayback Machine. ↑ "Cuppa Starbucks for the Cup". Times Live. สืบค้นเมื่อ May 31, 2010. ↑ "Starbucks Newsroom: Starbucks Celebrates First Store Opening in El Salvador". News.starbucks.com. Archived from the original on December 9, 2010. สืบค้นเมื่อ July 7, 2011. ↑ Puget Sound Business Journal by Eric Engleman (October 27, 2010). "First 'Starbucks at Sea' to debut - Puget Sound Business Journal". Bizjournals.com. สืบค้นเมื่อ November 17, 2012. ↑ "Tata Coffee brings Starbucks to India". Business-standard.com. January 14, 2011. สืบค้นเมื่อ July 7, 2011. ↑ Chatterjee, Saikat (July 20, 2007). "Starbucks Delays India Entry, Withdraws Application (Update2)". Bloomberg L.P. สืบค้นเมื่อ April 15, 2009. ↑ "Tata Global Beverages and Starbucks Form Joint Venture to Open Starbucks Cafés across India". Starbucks Press Release. Archived from the original on February 4, 2012. สืบค้นเมื่อ January 31, 2012. ↑ Farisa Khalid (October 24, 2012). "Veni, Vidi, Venti: Starbucks Expands Its Global Reach to Mumbai". Asia Society. asiasociety.org. สืบค้นเมื่อ October 25, 2012. ↑ Farisa Khalid (October 24, 2012). "Tata Coffee to close ranks with Starbucks". Business Standard. asiasociety.org. สืบค้นเมื่อ October 25, 2012. ↑ Raghuvir Badrinath (October 25, 2012). "Starbucks creates a stir in India". The National. business-standard.com. สืบค้นเมื่อ October 25, 2012. ↑ "Starbucks Celebrates Its 500th Store Opening in Mainland China". Business Wire. October 25, 2011. สืบค้นเมื่อ October 15, 2012. ↑ "Starbucks Opens First Store in Finland at Helsinki Airport". Starbucks Newsroom. Starbucks Corporation. May 14, 2012. Archived from the original on January 12, 2013. สืบค้นเมื่อ October 15, 2012. ↑ Patton, Leslie (October 4, 2012). "Starbucks CEO Sees Adding 1,000 U.S. Stores in Five Years". Bloomberg L.P. สืบค้นเมื่อ October 4, 2012. ↑ Burch, Adrienne (August 28, 2012). "Largest Starbucks in U.S. coming to the Ferg". The Crimson White. สืบค้นเมื่อ October 8, 2012. ↑ González, Ángel (May 14, 2014). "Starbucks to open stores in Bolivia and Panama". The Seattle Times. ↑ "New Starbucks location opens in Disney's Animal Kingdom". attractionsmagazine.com. Orlando Attractions Magazine. สืบค้นเมื่อ September 29, 2015. ↑ Smith, Thomas. "Starbucks to Open at Disney's Hollywood Studios in Early 2015". disneyparks.com. Disney Parks-Walt Disney World. สืบค้นเมื่อ October 14, 2014. ↑ Stinson, Liz (January 8, 2014). "With Stunning New Stores, Starbucks Has a New Design Strategy: Act Local". Wired. ↑ News, ITV (November 28, 2014). "Starbucks comes to Guernsey". ITV. ↑ "Starbucks Honors Colombian Coffee Heritage with Entry into Colombia Retail Market and Expanded Support for Farmers". Starbucks Newsroom. Starbucks Corporation. August 26, 2013. สืบค้นเมื่อ December 30, 2013. ↑ "Starbucks opens in Almaty". ↑ "Starbucks to Open in Slovakia". ↑ "Starbucks opens in Slovakia". ↑ "Starbucks arriva in Italia: "Nel 2017 il primo negozio a Milano"". La Stampa. February 29, 2016. สืบค้นเมื่อ February 29, 2016. ↑ "Facts about Starbucks in the Middle East". News.starbucks.com. สืบค้นเมื่อ October 24, 2010. ↑ "Starbucks closes outlets in Israel". Snopes.com. สืบค้นเมื่อ October 24, 2010. ↑ "Starbucks closes coffeehouse in Beijing's Forbidden City". The New York Times. July 15, 2007. สืบค้นเมื่อ October 15, 2012. ↑ "Forbidden City Starbucks closes". BBC News. July 14, 2007. สืบค้นเมื่อ November 13, 2011. ↑ "Coffee Crisis? Starbucks Closing 600 Stores". ABC News. July 1, 2008. สืบค้นเมื่อ July 18, 2008. ↑ Adamy, Janet (July 2, 2008). "Starbucks to Shut 500 More Stores, Cut Jobs". The Wall Street Journal. ↑ Lauren Shepherd (July 29, 2008). "Starbucks cuts 1,000 non-store jobs". USA Today. Associated Press. สืบค้นเมื่อ December 1, 2012. ↑ Allison, Melissa (July 29, 2008). "The Seattle Times: Starbucks closing 73% of Australian stores". Seattletimes.nwsource.com. สืบค้นเมื่อ October 24, 2010. ↑ "Starbucks: What went wrong?". Australian Food News. สืบค้นเมื่อ October 24, 2010. ↑ "New owners for Starbucks Australia". news.com.au. News Limited. May 28, 2014. ↑ Adamy, Janet (January 28, 2009). "Starbucks to Close More Stores". The Wall Street Journal. สืบค้นเมื่อ January 28, 2009. ↑ Allison, Melissa (March 3, 2009), "No more layoffs at Starbucks, Schultz says", The Seattle Times Blog. Archived from the original on September 21, 2010. ↑ "Hartfordbusiness.com". Hartfordbusiness.com. สืบค้นเมื่อ October 24, 2010. ↑ Chesto, Jon (August 28, 2009). "Patriotledger.com". Patriotledger.com. Archived from the original on May 27, 2011. สืบค้นเมื่อ October 24, 2010. ↑ Patton, Leslie (July 27, 2012). "Starbucks Falls After Cutting Forecast Below Estimate". Business Week. Archived from the original on November 5, 2012. สืบค้นเมื่อ October 12, 2012. ↑ "The Insider: Principal roasts Starbucks over steamy retro logo". Seattle Post-Intelligencer. September 11, 2006. สืบค้นเมื่อ May 23, 2007. ↑ Schultz, Howard; Dori Jones Yang (1997). Pour Your Heart Into It: How Starbucks Built a Company One Cup at a Time. New York: Hyperion. ISBN 0-7868-6315-3. ↑ Allison, Melissa. "Starbucks co-founder talks about early days, launching Redhook and Seattle Weekly". Seattletimes.nwsource.com. สืบค้นเมื่อ May 9, 2014. ↑ Larimore, Rachael (October 24, 2013). "Starbucks business strategy: How CEO Howard Schultz conquered the world". Slate.com. สืบค้นเมื่อ May 9, 2014. หน้านี้แก้ไขล่าสุดเมื่อวันที่ 10 เมษายน 2562 เวลา 05:18 น.